Vicar Amelia (教区長エミーリア Kyōku-chō Emīria lit. 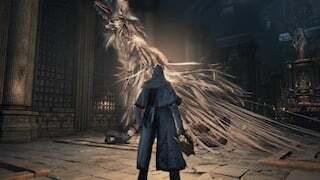 "Vicar Amelia/Emilia") is a Boss in Bloodborne. "Remain wary of the frailty of men. Their wills are weak, minds young." "Let us pray, let us wish... to partake in communion." "Let us partake in communion... and feast upon the old blood." "Our thirst for blood satiates us, soothes our fears." "But beware the frailty of men. Their wills are weak, minds young." "The foul beasts will dangle nectar and lure the meek into the depths." 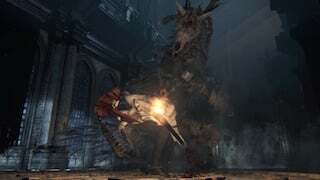 "Remain wary of the frailty of men..."
After defeating Vicar Amelia and interacting with the altar, the world state advances and turns to night time. At night, some enemies become stronger, while others fall asleep and won't react until the player approaches them. In Cathedral Ward, past the big circular graveyard, up the stairs, inside the Grand Cathedral. 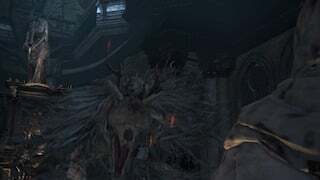 Vicars were the heads of the Healing Church, as is revealed in the item description for the Gold Pendant, which she can be seen clutching in the cutscene, and even in battle after her grotesque transformation. 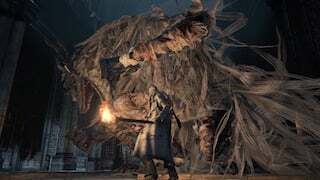 This would make her the last Vicar, who oversaw the Church as Yharnam fell to the beasthood brought upon it by misuse of the Old Blood. 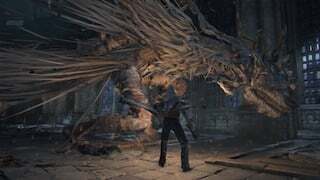 As the player finds her, she is seen praying to the altar in the Grand Cathedral which hold a misshapen skull, presumably that of Laurence, the founder of the Healing Church. 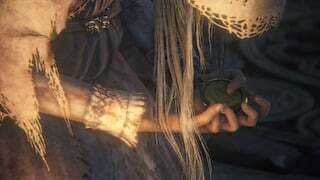 Here she kneels awaiting her inevitable transformation, praying, clasping her pendant which existed to carry a reminder that had been all but forgotten, and that may have prevented the madness that led Yharnam to ruin before her eyes: Fear the Old Blood. This requires the Hunter Chief Emblem item purchased from the Fountain in Hunter's Rest for 10,000 Blood Echoes. Upon arriving in Cathedral Ward, take the Left exit and then the Right path past 2 enemies that use walking sticks as weapons. This will lead you to a big set of stairs and a Giant enemy, take the stairs upwards and use the Hunter Chief Emblem on the closed gate. This is the quickest way to open the gate and unlock the ability to summon people. 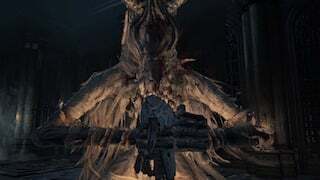 Assuming you've already unlocked the shortest route to this Boss from the Cathedral Warden Lantern, take the exit directly ahead of you when you arrive at Cathedral Ward and then go up the big stair case to your right. Once you're past the gate at the top take a Left and follow the low path to a Lever near the bottom of another big stair case, the Lever opens a gate to the big round Central Plaza area (2 giant enemies patrolling it). If you run across this area to the opposite side you'll reach the required gate with a Lever nearby to open it. 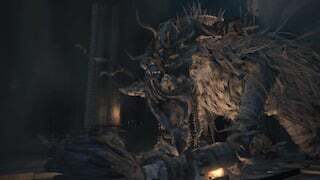 Assuming you've already unlocked the shortest route to this Boss from the Cathedral Warden Lantern, take the exit directly ahead of you when you arrive at Cathedral Ward and then go up the big stair case to your right. Once you're past the gate at the top take a Left and travel straight past the big stair case (Central Plaza should be on your left and the big stair case on your right), there should be a Dog enemy here. Near the Dog enemy is a Ladder, climb it, climb another ladder then descend a 3rd ladder to circle around the perimeter of the Central Plaza area to reach the gate & lever. Phase 2: 50% HP - In addition to the normal move set, she receives a healing ability, a few new combos, and becomes more aggressive with attacks. Strong against Blunt, Arcane and Bolt damage. Can be staggered and possible to perform a Visceral Attack on her (when her head is down and the "parry" sound plays) during all phases. The main trigger for this appears to be heavily damaging her legs. She has a wide variety of attacks, covering her sides, close range, and long range, so there is no "safe" zone and requires lots of dodging or distance. It is not recommended to stay behind Vicar Amelia, as her tail completely obstructs your view. After each of her attacks, there is an opening for one or two attacks, so it is key to stay close and dodge in to get close to exploit these openings. The Threaded Cane seems to be helpful for this fight in its whip form as the attack path goes higher and ends up hitting her in the head. Its possible to chain attacks on her after multiple head strikes and stuns. 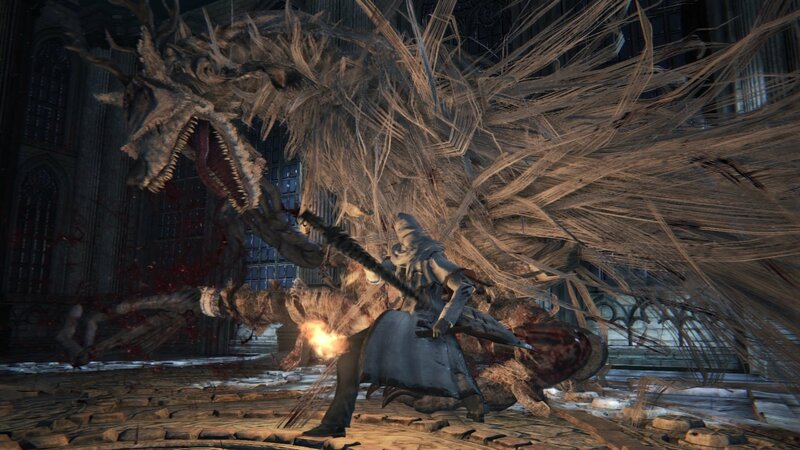 Since this boss heals in Phase 2, it is recommended to bring Numbing Mist with you to stop her from healing. The effect only lasts a short while so reapply as needed. Old Hunter Henriet can be summoned for this fight and makes it considerably easier. Although Henriet doesn't do that much damage, Amelia will tend to focus on her instead of you, allowing you to spend more time attacking instead of dodging. Both legs. Attacking one many times or both moderately will make her drop on her knees, allowing for a Visceral Attack. Left arm. Attacking her left arm will periodically stagger her. When staggered she lowers her head, which can then be hit. Right arm. If the left arm is sufficiently damaged, attacking the right arm can also result in a (shorter) stagger. Head. Her head is her factual weak point. 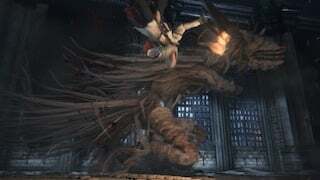 It is the only body part that can be attacked critically (similar to the Cleric Beast). It also takes the most damage, if you're able to hit it (when staggered, mostly). If hit enough times she will cover her head with both hands/claws, leaving her open for quite a while. Right Claw Claws the ground with her right arm. Dodge right and attack. Right Swing A close range swing with her right arm. Dodge right and attack. Right Swing and Claw A close range swing with her right arm then claws the ground once with her right arm. Dodge right and attack. Right Swing and Backhand A close range swing with her right arm and a backhand swing. Dodge right and attack. Left Ground Pound Pounds the ground in front of her with her left hand. Dodge left and attack. Triple Right Ground Pound Slams the ground in front of her three times with her right arm. Dodge to her side and attack. 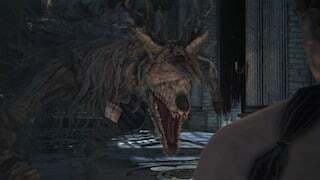 Bite If the player is close in front, Vicar Amelia will quickly bite the player. Don't stand in front of her. Grab Raises both arms high in the air for a moment, then grabs, bites, and throws you away. (If she is injured, she will use one arm) Dodge to the side and attack. Howl The boss will arch her back and howl and glow gold for a moment, restoring her to full capability. Gives you time to attack her once or twice. Ground Blast She will rise up, bring her hands together, then slam her hands to the ground, causing a linear medium-range AOE. Medium recovery animation. 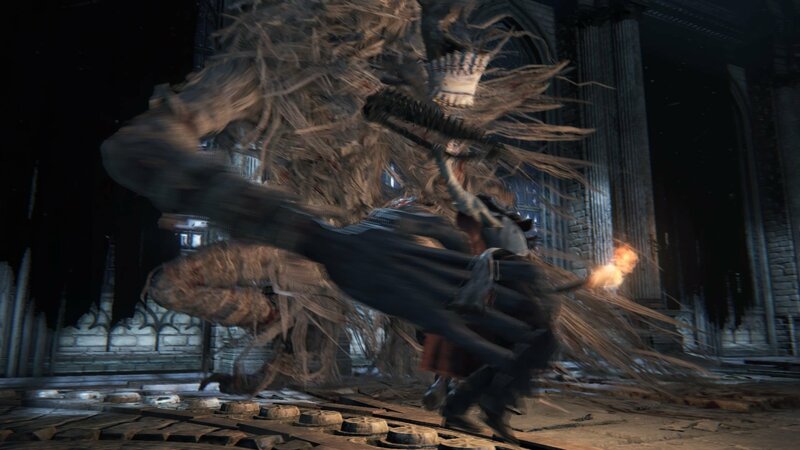 Lock onto Vicar Amelia, and when she reaches peak height, dodge to the upper left/right and attack. Pounce Usually done when she runs on all fours. She will leap into the air and try to hit you with her right claw. Easily avoided by dodging to your left as she descends, and leaves her open to a hit or two. Pincer With arms wide open, she sweeps with both arms in front of her. Dodge to the side and attack. Retreating Left Backhand She raises her left arm across her body and backhands to her left side as she steps back away. If you are close, dodge to the side and attack. Wide Right Sweep She sweeps to the left with her right arm. Dodge right and attack. Ultimate Combo Quickly slams the ground four times, wide right sweep, right backhand, then a long range right sweep. If you are close, dodge to her side and attack. If you are far, move back and don't get hit by the long range sweep. 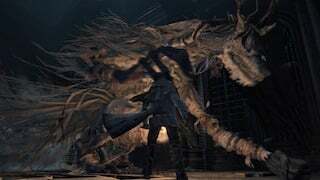 Wide Left Sweep and Double Right Claw Pound Vicar Amelia sweeps with her left arm, then claws the ground twice with her right and ending with a left ground pound. Dodge right and attack. You'll need some Bone Marrow Ash, Fire Paper, Molotovs, and as many Quicksilver Bullets. You will be using the Threaded Cane Whip and Repeating Pistol as weapons. The strategy for this is basically to learn her moves first so go through the fight a couple times and know what her tells are and how to time your dodges (you can see what happens when it's off). You want to save your Bone Marrow Ash for when she is going to heal if you run out that's what the Molotovs will help with. Use your Fire Paper with the whip and bring her health down and when she starts to heal use your Bone Marrow Ash with the Repeating Pistol to stagger her out of it (if this doesn't work you may need to upgrade the pistol). If you run out of Bone Marrow Ash use your Molotovs or run in and wail away with the fire whip (a normal whip won't do enough damage). Get yourself the Saw Cleaver from the messengers or the Saw Spear from one of the hanging corpses in Central Yharnam. These weapons both have a hidden "serration" damage property that boosts their power against beasts. Bait out one of her swiping attacks, then dodge through it so that you're in place for a shot at her legs. Try to get 2 or 3 fast hits in, or just a single R2, then dodge away before she tries to backhand you. Repeat this process until her legs give out and she's on her knees. This is a signal that you can do a Visceral attack, so quick step yourself in front of her and rip her brains out. Repeat until dead. If she's not giving you many opportunities to hit her legs, go for one of her arms first in order to stagger her. When she slowly raises one or both fists above her head, get ready to dodge the incoming shock wave. She will be open for a moment after using this attack, so use it to hit her arms for a potential stagger, which will open up her legs for punishment. If she jumps at you, try dodging towards her and to the side to get closer to her legs when she lands. Fire Paper or Molotov Cocktails combined with Oil Urns can make this fight go by a bit faster. Also bring Numbing Mist, and wait for the pause in between her attacks to throw it without getting countered. Apply the mist again every half minute or so to preemptively stop her from healing. Even if she is under the effects of the mist, she will still try (and fail) to heal if she has some distance from you, so use that as a cue to get in some more damage. Her healing ability can be cancelled and blocked by Numbing Mist. This item can be found early in the game by climbing the ladder behind the gate where the Wooden Shield is found, or by sending the Lonely Old Woman to Iosefka's Clinic, then speaking with Iosefka. Her fight arena can be reached without using the Hunter Chief Emblem. This is done by killing the Blood-Starved Beast, which triggers the unlocking of the door in Oedon Chapel that leads to the Healing Church Workshop. This area can be traversed to get behind the gate that would normally be opened by the emblem. After defeating her and interacting with the altar, it will be night time. Her dialogues can be heard before triggering the fight if the player stands at the top of the stairs and listens closely. 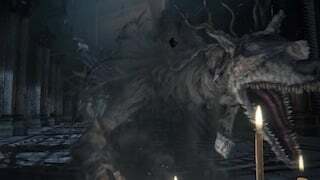 Vicar Amelia shares her boss theme with the Cleric Beast, presumably because both Amelia and the Cleric Beast were once members of clergy and got turned into beasts. Fog gate glitch: If host engages cutscene without both players(summons) in the world, it wont allow the last player through. 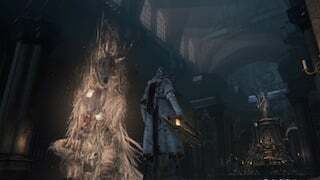 Intrestingly enough, Vicar Amelia also makes a re-appearance in the Old Hunter's DLC as a Church Hunter. 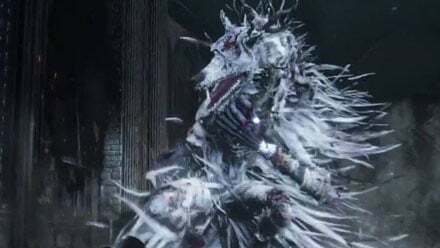 She is wearing the white garbed Church hunter by the Surgery Alter after you defeat Ludwig the Accursed, while also chanting the same chant when you first encounter her in the Grand Cathedral. Becareful when you approach her, as another Church Hunter is hiding and waiting to ambush. You can also cancel her healing by stunning her (by making her arms take significant damage). I doubt I would have beaten her if I hadn&apos;t stunned her when she started healing. I&apos;ve tried to get a summon for this but that bro stuck in lower area and refused to come to the boss. do I need to meet some requirements for the summon to come to the boss fog? No mention of where the NPC summon is? Also my Small Resonant Bell can&apos;t be rung anywhere in the areas leading up to the boss fight (I&apos;ve already triggered the cutscene). Could it be that this "slugbaby thing" watching down from above was triggering her mutation? They seem to hugely increase beasthood with their powers. There&apos;s a comment about her reappearing in the Hunters Nightmare, but the two are voiced by two different voice actors. While it&apos;s a nice theory, it&apos;s far from confirmed that the white church Hunter is Amelia. fun fact: Amelia&apos;s cinematic human model is a re-textured Chime Maiden, as confirmed by Sanadsk on his youtube channel. If you look at the models of her and the Chime Maiden, you would notice some similarities. During my fight with her, I noticed she would occasionally glow blue in-between attacks, but I can&apos;t seem to find any information on what that&apos;s all about. This was similar in appearance to the gold glow, but definitely distinct. “Amelia is likely the last vicar.” For now, yes, but vicars are chosen by the congregation, not by blood or matriarchy. I have a feeling a lot of vicars have passed through the Healing Church, and probably all met similar fates. 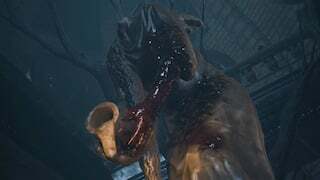 Vicar Amelia is the beast at the end of the Face Your Fears trailer. You can tell that statue is the one you find her praying at, and if you look closely, you can spot almost all of her face just as she rises up behind the hunter. I think her beast form is adorable. It&apos;s like a demon deer-puppy, I&apos;d love to have one as a pet.